For being such a huge commercial success, I don't think that Stephen King is that great a writer. Of course, that's not uncommon (I'm looking at you, James Patterson). What King excels at is storytelling, not the particular turn of phrase. 11/22/63, though, largely overcomes its occasionally ham-handed prose to tell a heck of a yarn. Jake Epping is a high school teacher in suburban Maine who stumbles upon a portal into the past, specifically to to a summer afternoon in 1958. Each time he goes back is a complete reset of all previous trips, and, though he takes a couple of side trips along the way, his main mission is to stop Lee Harvey Oswald from assassinating JFK. This obviously involves, if you can subtract, waiting around for more than five years in the past. As I said, though, King is a master storyteller, and he finds plenty for his hero to do. The book earns demerits for the leaden writing (King mentions that the past is "obdurate" and doesn't want to be changed approximately 1,789 times) and sub-plot recycling (the past also "harmonizes" with itself: 2,342 times), not to mention the crippling problem of never really explaining why Epping feels so compelled to save Kennedy in the first place. It overcomes these obstacles, though, by excelling at prompting the reader to keep turning pages (and it had better; the novel comes in a lean 849 of them!). King is at his best writing short stories (find The Running Man and burn your VHS copy of the movie) and most of his novels are anything but. 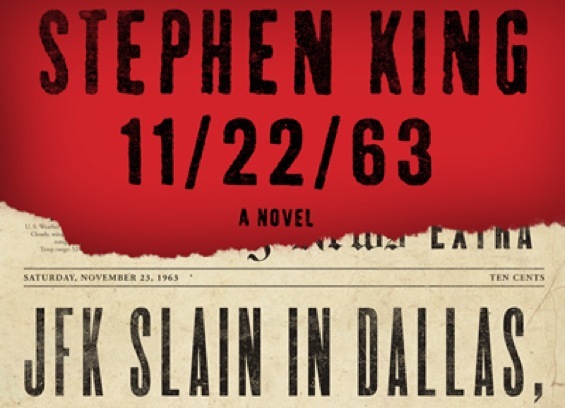 11/22/63 could stand to be 300 pages shorter (which is really saying something! ), but is an entertaining read nonetheless.